As a general rule, nobody likes to be wrong. There’s a growing consensus that the 2017 Ducks are looking at a 6-6 season. In the past week, both Jon Wilner of the San Jose Mercury News and Andrew Greif of Oregonlive have joined our own Mr. FishDuck, Charles Fischer, in assessing the Ducks as the acme of mediocrity. If the Ducks end up having a banner year, Wilner will probably shrug his shoulders and get on with life. Can’t win ’em all. Greif will probably go on Canzano’s Bald Face Truth and demonstrate some 20/20 hindsight. Charles? We’ll be scraping him off the ceiling. On this point, nobody wants to be wrong more than Charles does. The only 6-6 you can count on for the Ducks this year is Justin Herbert’s height. The power offense game just might be more ready-to-go than most people think. Critics point out that it will take some time to recruit the offensive linemen needed to make it work. Far be it from me to assess the relative talent of offensive linemen. 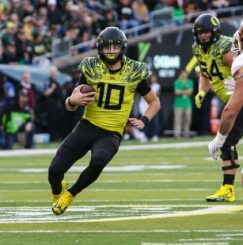 Size, though, I can handle, and what Oregon is putting on the field this year is not your Chip Kelly fast-but-undersized. This is not little guys practicing the fly sweep. 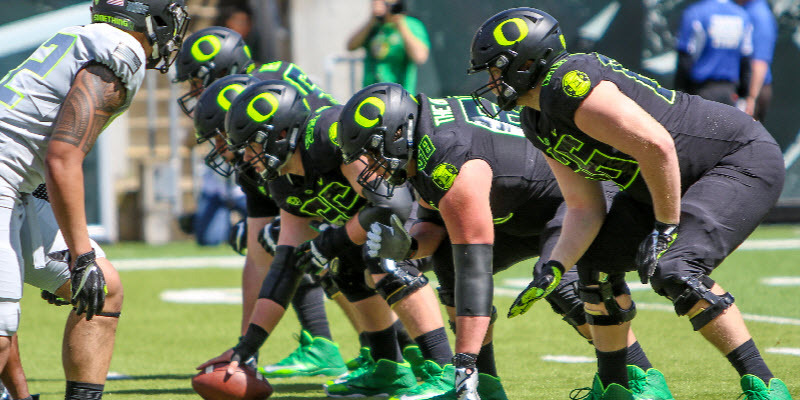 Here’s what appears to be Oregon’s starting offensive line: Tyrell Crosby (320), Shane Lemieux (317), Jake Hanson (302), Jake Pisarcik (287) and Calvin Throckmorton (307). That’s not exactly your Charles Atlas lineup of 97-pound weaklings, but how far away are they from, say, Alabama-sized? Note that the offensive line weight of one possible Ducks’ lineup is actually one pound more than Alabama’s. 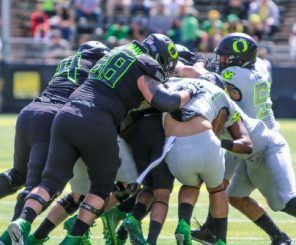 So while it’s nice to dream about the 330 – 350 pound O-linemen committed to the Ducks for next year, it’s safe to say that the “undersized” label is nothing more than historical thinking. But of course it takes more than big offensive linemen to make a power running game. It takes coaching, and it’s not as though Oregon has Alabama’s offensive line coach. Oh, wait a minute. That’s right. Oregon does have Alabama’s offensive line coach. Royce Freeman will likely break the career rushing record for the Ducks this year. But what’s a power running game without a power running back? 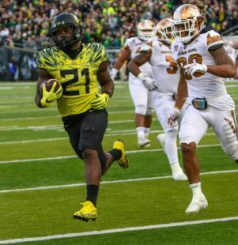 Truth is, there’s not a power running back in the Pac-12 – if not in all of NCAA – that anyone would trade for Royce Freeman, beefed up to 238 pounds for his final year as a Duck. So, on offense, it’s really down to the dig on the Ducks’ wide receivers. No “go-to” guy. I had a long phone call with Charles a few nights ago, and told him that I didn’t agree that the cupboard was as bare as he thought at receiver. He rightly made the point that there is not a lot of experience. But sometimes, the newbies coming in do amazing things. My personal experience – I had worked my way up to All Pac-8 (Yes, it was that long ago.) in the 200-yard breaststroke by my junior year. My senior year I got blown to oblivion by four newcomers to the conference, all with no, or next to no, college swimming experience. Of course it was to their benefit that they were all among the top 10 in the world. 6-6 would not be much to cheer about. Nobody seems to be considering the possibility that the Ducks might just be “reloading” instead of “rebuilding” at the wide receiver position. That’s a bit of a dig on Dillon Mitchell, Alex Ofodile and Malik Lovette. They may not be top ten in the world, but they were all four-star recruits, and now have a year or two in the program. They should be ready to step up. Throw in Charles Nelson, a developing tight end in Jacob Breeland, perhaps Taj Griffin in the slot, or Freeman, Kani Benoit or Tony Brooks-James coming out of the backfield, and you have to acknowledge the possibility that there might be somebody to throw the ball to. But let’s get back to the quarterback issue. My experience as a receiver is limited to touch football, so maybe that doesn’t exactly qualify me as an expert on the relationship between receivers and quarterbacks. However, I must say that I was a much better receiver when the quarterback-for-the-day could actually throw the ball where I could catch it. I’m going to go out on a limb here and say the same probably applies at the NCAA level. Justin Herbert is an incredibly accurate passer. As a pitcher in high school baseball, he had an ERA of under 1.00. As someone who got pulled quite early in his one start on the mound as a Little Leaguer, I am painfully aware that you’ve got to have a pretty good ability to put a ball where you want it to have an ERA under 1.00. We saw Herbert demonstrate that same ability on the gridiron last year. And that will only help the receivers step up and make plays. Duck receivers have stronger d-backs to practice against this year. One last point about the receivers. 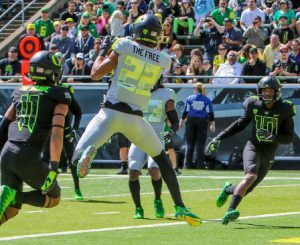 From everything I’ve read, the 2017 Ducks receivers actually have some defensive backs who don’t give a 10-yard cushion to practice against this year. Again I’m no expert, but it seems logical that practicing against defenders who are in your face will be better game prep. I come to the conclusion that stacking the box against the Ducks to stop the power running game just might not work out very well every time. There is no way that the players on Oregon’s defense aren’t at least mediocre at the FBS level. Good Lord, if you want to recruit at the lowest level, you’ve got to compete with the likes of Idaho, Rice, Bowling Green, Akron, New Mexico State, Florida Atlantic … and many, many more who just don’t have a chance to grab the elite athletes. So I’m going to go out on another limb and say that we should consider the possibility that the Ducks defense should at least be able to rise to the level of mediocrity. And with the punch of the Ducks offense, that should win a lot more than six games. As Charles and I discussed, there are many possible outcomes to any football season. In August, nobody has the infallible crystal ball. To the extent that we try to be objective, our expectations are inevitably skewed by the way we feel. The feelings we were left with last year are enough to make most anybody think in terms of 6-6, or worse. Last year’s green Kool-Aid did not sit well, and it has to temper expectations. Just don’t be surprised when, come December 2017, Charles is gloating about how wrong he was.